In the previous article, we saw how to create the first Windows Phone Project using Oxygene. In this article, we will try to understand the project structure of the Windows Phone Project. Note that the list of default files in the project will differ based on the project template selected when creating the project. When a “Windows Phone App” is selected as template, by default the following files / folders are created. 1. MainPage.xaml / MainPage.xaml.pas – This file is created by default along with the code behind file (MainPage.xaml.pas) and is the starting point of your Windows Phone app. You can change the starting page in the app manifest file. 2. WMAppManifest.xml – This is one of the important app manifest file. This file contains the necessary information about the app which needs to be identified by the Windows Phone OS. This file also contains the app name, default start tile, supported resolutions of WP8, capabilities of the app and requirements. 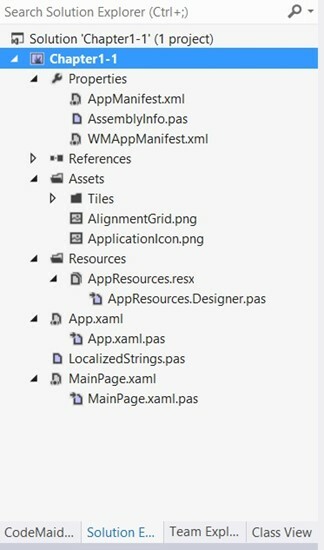 Although, it is a XML file, the Visual Studio 2012 includes GUI to easily edit the WMAppManifest file. 4. The AppResources.resx, AppResources.resx.pas and LocalizedStrings.pas lets the developers to include the localization feature in the app. 5. The App.xaml file lets the developers to store resources which can be used across the app like styles etc. The App.xaml.pas contains some of the core Windows Phone App lifecycle events like launching, closing etc.